Big day yesterday and one of my favorites of the year, as I ran the 13th annual GreenHorn tournament at Dragan Field. I have a page on the site here that gives the backstory and purpose of the GreenHorn tournament. For the second year in a row, I was able to combine it with the Trilogy Challenge. If there’s anything I feel is lacking in disc golf, it is proper rules awareness and education. Too often, players new to tournament play are thrown in and expected to pick up what they need to know as they go. And in doing so, are (unintentionally) taught some half-truths and misinterpreted rules as often as they’re shown and told the correct way to do things. To do my part to correct that, I run the GreenHorn tournament every year and do my level best to give some of our local players a proper grounding in tournament rules and etiquette before they venture into the larger disc golf tournament world. No going into bigger tournaments thinking falling putts are fine and throwing from OB is the norm. Twenty players came out for the fun, eight just for the Trilogy Challenge, and 12 there for the full GreenHorn experience. It was a much closer battle for the Trilogy title this year with a 17 throw difference between low and high score (as opposed to a whopping 62 throws at last year’s event). In the end, Lance Norton won the Trilogy round with the only sub-60 score of the day, a 57. For the GreenHorns, it was a close battle the whole day, requiring two extra holes before Shannon Cote emerged the overall winner of the day, shooting 61 +65 = 126. Full results here. Next week continues the Trilogy and GreenHorn events, only separately. Saturday I host a second Trilogy Challenge at Enman Field in Brunswick, and then on Sunday, it’s GreenHorn Doubles. Same idea as the singles, only we double up the fun, best-shot style. Edit on 4/24: Was writing a second part then decided to combine it with the first for one big post. The timing of this is due to doing all this prep in anticipation of the first “real” tournament of the year this weekend. Heading out for a tournament, I like to leave home believing I have everything I might need for the day. So in the interest of helping out those that are just starting to play tournaments, here’s the basic list of things I like to make sure I have at a tournament so I’m not left wanting at the course. Discs and golf bag. Big ol’ duh on this one, right? Who goes to a tournament without their discs? It happens. The further I’m traveling from home, the more painful such a mistake would be. I’ve been witness to more than one player showing up with maybe not their whole bag gone, but at least a key disc or two (putters seem to be the biggest culprit). So I’m extra careful to make sure I’ve got all of my discs with me. Back-ups discs. Ideally, I like to have at least one back-up for every disc in my regular bag, whether it’s an exact duplicate or something that can do the same job similarly. However, depending on where I’m playing and any space considerations I have to account for, sometimes I have to go with the bare essentials for back-ups. In that case, I try to at least have back-ups for anything I think I might throw near water or any other hazard from which retrieval of a disc could be difficult. And extra putters. Always extra putters. Minimum two changes of clothes. That’s head-to-toe changes of clothes, not just an extra shirt or pair of shorts. I like to have a change of clothes for the afternoon and one to change into at the end of the day. This is key for a wet rainy day but also helpful on a hot summer day when sweat can make you just as damp as a rain shower will. Extra pair(s) of shoes and socks. At least one change of shoes, if only to wear for the ride home. If conditions warrant, it’s handy to have a second pair of shoes to play in as well. For the socks, it’s the same thing…at least a dry clean pair to go home in and a fresh pair for round 2. But since socks don’t take up much space, I’ll usually carry double what I think I might need just to be sure. Dry comfortable feet are the key to the rest of the body feeling good. Food and water. Since you never know what the food situation might be at the course, it’s good to have something with you so you know you’re covered. Many tournaments will provide lunch options, but some don’t. Sometimes there’s something close enough to run out during the lunch break, sometimes there’s not. Same concern goes for water (or gatorade or whatever your hydrating beverage of choice happens to be). You want to be sure you have enough to keep yourself fed and well hydrated all day. To keep all these things organized and easy to access, I like to use one or two Sterlite containers like this one for a lot of the above items. Their dimensions allow for discs to be stored securely and the containers can also hold shoes, clothes, towels and any number of other things as well. Add in a small cooler for the food and water, and I’m good to go. Typical look of my trunk before heading out for a tournament. One Sterlite with shoes and other gear, another with back-up discs and towels, a third with discs for sale, a cooler, and of course, the golf bag. Once I have everything gathered and organized, it all goes in the car. 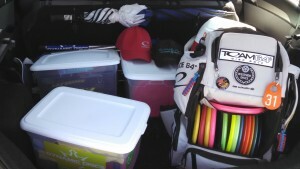 The above photo is what my trunk usually looks like the night before a tournament. Everything but the food, if it’s perishable, goes in the night before. The way I look at it, anything I can do the night before is that much more time I can sleep in the morning. Once the car’s packed up, the next item on the agenda is to get a good night’s sleep. By no means do I go to bed super early or anything like that, but I do try to avoid watching the all night kung-fu marathon on channel 39. If I am drinking before bed, it’s water. That strategy is two-fold. One, of course, is hydration. If I want to be well hydrated on the course, it always starts the day before. Two, let’s just call it a natural alarm clock. Drink enough water before bed and your bladder will let you know it’s time to get up in the morning. My preference on tournament morning is to get to the course somewhere between 60 and 90 minutes before first tee time. Doing so gives me plenty of time to check-in with tournament staff, assess the conditions (weather and course), and warm up. So my whole morning schedule, from waking up to showering to eating breakfast to driving to the course, is based on getting there within that time frame. If the tournament is on a course that I’ve either never played or haven’t played in a while, my 60-90 minutes early window changes to at least two hours before go time (and everything else is adjusted accordingly). I want to have time to walk as much of the course as I can (if I haven’t been there) or walk/play any holes that have changed or I can’t remember well since my last visit. Upon arrival, the first thing I want to do is check in to the tournament. Let them know I’m there and pay my entry if it isn’t a pre-paid event. Once that’s out of the way, my focus goes to the course and warming up. Assuming there aren’t any holes that I feel like I must see or play before the tournament round starts, my warm up routine is fairly simple. I find a secluded basket and I putt for at least 15-20 minutes. The choice to seek a secluded basket is not so much an anti-social thing as it is a means to be more efficient with my warm up. Utilizing a popular basket, be it a practice basket or whatever is closest to the parking lot/tournament central, can get tedious when there’s more than a couple people putting at a time. I’d rather not spend too much time dodging other putts or waiting for everyone to throw all their putts in order to retrieve my discs. If I don’t have a basket in mind for my warm up, I will usually play my way out into the course, pick a hole, and do my putting. When I’m done, I simply play my way back to the parking lot. This way, I get some full throws in during my warm up. Once that’s done, I go back to the car, make sure my golf bag is in order (plenty of water, plenty of towels, etc), and then I sit down and relax. That is perhaps the best part of my morning. Just sitting and not worrying about having to be somewhere or do something for a few minutes. I look at it as the calm before the storm that is the tournament, because it’s a calm I want to try to carry into and right through that storm too. Continuing this week’s theme of tips and advice aimed at newcomers to organized competitive play, a quick breakdown of a small part of the rule book oft-overlooked when folks are advising new players. Scorekeeping is such a simple task that most assume everyone knows how to do it, but in my experience as a tournament director as well as a course manager, I’ve seen enough variations in scorekeeping style/technique to realize that a primer on the tournament-acceptable techniques is in order. So here it is, PDGA Rule 805.02 in Q&A form. Who starts the round with the scorecard? Playing groups are determined by the tournament director. The first player listed or called for each group is typically the one responsible for picking up and bringing the scorecard on to the course at the start of the round. Who keeps score when there’s only one scorecard for the group? How and when should scores be recorded? After each hole is completed and the group has reached the next tee area, the scorekeeper should call out each player’s name in turn, with each player responding with their score on the hole. Each score must be recorded as a numeral representing the total number of throws plus penalties on the hole. Symbols, codes, blanks, or shorthand relative to par are not acceptable score notations. If a player took a 3 on a par 4 hole, the score should only be written on the card as “3”, and not “-1” or anything else. Scores not recorded properly can be penalized by the tournament director (2 penalty throws added to the total score). Who adds up the scorecard at the end of the round? Each player is responsible for adding up and writing down their total score on the scorecard at the end of the round. The total score must be written as a numeral representing the total number of throws plus penalties. The total must be added and written correctly or the player is subject to a two throw penalty added to the correct score. When should the scorecard(s) be turned in after the round? The scorecard(s) should be turned in immediately after the end of the round. All players in the group should take care to check and double check that the scores have been noted and added correctly, and then the scorecard(s) should be brought to the tournament director or designated alternate. Scorecards that have not been turned in within 30 minutes of the end of the round are subject to a two throw penalty. Am I still penalized if I am not the one who mis-added my scorecard? Yes. You and you alone are responsible for your score. It is the responsibility of each player to ensure that their scores are recorded correctly, added correctly, and turned in after the round in a timely manner. Handing off the scorecard to be added and/or turned in after the round does not excuse a player from being penalized in the case of an error. It is always a good practice, whether you have it in hand or not, to stay with your scorecard from the moment the round has ended until the scorecard is handed in to the TD or appropriate staff member. This all might seem like much ado about nothing, but it won’t seem so trivial after the first time you are hit with a two-throw penalty for a mis-added or late scorecard. It hurts because it’s such a simple penalty to avoid. Though once you get penalized once, your vigilance goes up tenfold in an effort to never be penalized for it again.